Get your Mother's Day flowers delivered via an online store while there's still time. You might be cutting it close, but worry not, there's just about still time get an order of Mother's Day flowers delivered via an online florist. Finding a reliable one can be tricky if you're shopping for the first time, but we've done our homework and compared the best ones out there to find a florist that won't let you down. We've plucked our way through the best places for flower deliveries online, so you've got plenty to choose from. While we're just a fee days away now, these florists are still taking orders online with various delivery windows remaining open. If you opt for standard delivery for arrival in a few days' time, you're more likely to pay lower delivery costs, while most charge extra if you want them to be delivered specifically on Mother's Day this Sunday March 31. You can get flowers delivered to your mum's home or workplace and if you're not sure if they'll be home to receive the delivery, be sure to check out the letterbox-friendly options we've mentioned. That's where the flowers can be delivered boxed in the regular post before they open up and bloom. There's a fantastic and broad range of beautiful bouquets and gifts available from our selection of florists below. And online delivery from a specialist company means you don't have to worry about the usual hassle of buying from a regular florist and getting them home safely through the commuter crowd. So yes, shop smarter this year for Mother's Day flowers and leave it to the professionals in our list below. If you're thinking of something else that could be a great gift for Mother's Day, how about creating a unique gift via our roundup of the best photo books for a more personalised gift? If you have siblings and you want to win Mother's Day, this is the way to go. Floom has a marvellous selection of natural-looking bouquets. Stock, prices and delivery availability vary by postcode, so enter the recipient's address before browsing. The actual Mother's Day flowers collection isn't particularly large, but if you shop around the full site you'll find many other options to consider. There's an extensive collection of other plants too if you want to give something that'll last much longer than flowers, which arguably makes them the better gift for some. Boasting a four-star Trust Pilot rating with over 150,000 reviews you can rely on Serenata Flowers to get the job done. With Mother's Day flower bouquets from £24.99 and FREE dedicated-day delivery options available at the time of writing this is a very tempting florist. This long-running florist boasts over 10 million bouquets delivered. So it's no surprise to see a great selection of Mother's Day themed arrangements available in its vast selection. Delivery is £5.99 on Mother's Day itself or FREE any other day. There's also a special promotion running right now where you can get a free box of chocolate truffles when you use the voucher code TRUFFLES at checkout. After a vibrant and bright bouquet this Mother's Day? Then check out eFlorist's options. Many options today have had up to £15 knocked off the usual price to make the already competitive prices even more tempting. if you want to give a little something extra then you could also opt for a bouquet that comes with some free chocolates. Delivery prices for Mother's Day itself are currently only £5.50 which is far cheaper than most. If there's one thing that makes Bloom & Wild stand out from most other online flower delivery services, it's the excellent selection of Letterbox options. That's right, specially selected flowers, carefully packaged in a box that'll fit through the post. Delivery is free most days, but will cost £8 to ensure arriving on Mother's Day and a bit less on the Saturday. While not the cheapest option, it's arguably the most convenient if the recipient isn't guaranteed to be at home for delivery - making it easier to surprise them too. You can actually get a better deal than usual thanks to our our exclusive Bloom & Wild voucher code to save 10% on flowers and gifts at the site (not including workshops or delivery fees). Enter the code: TECHRADAR at checkout. This store has been a known specialist of personalised birthday cards for years now in the UK and has continued to find success with a wider range of gift options too. You'll find tempting prices on flowers, gift sets and more on the site. Moonpig also includes letterbox sets of flowers that can be posted through your door without you have to wait around at home although the selection isn't as impressive as those found at Bloom & Wild above. You can get a free card with flowers if you use the voucher code TELLMUM at checkout. Delivery on Sunday will cost £6, or £4 for a different day. Last, but most certainly not least, there's always Amazon. 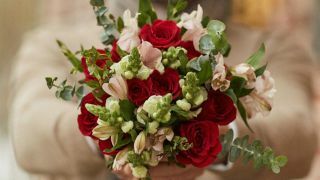 The online mega-retailer has a strong selection of florist partners for a huge range of Mother's Day flowers that can be ordered online and delivered on time, although specifying delivery days isn't usually an option. Amazon Prime members can at least benefit from super fast delivery on select bouquets.